A goofy thought played out with pen and digital color. The beauty is that whether or not you understand or believe in it, science keeps on happening (in you and around you, as well as quite independently of you) in complex and fantastic ways. The tragedy is that House Republicans are currently trying to limit our ability to understand and benefit from this natural complexity. This comic *would not* pass the rigors of peer review, but it might slip by a politically elected board if it somehow appeared to promote the domestic economic interests and/or those of national defense. Let’s keep the peer review in science and politics out! 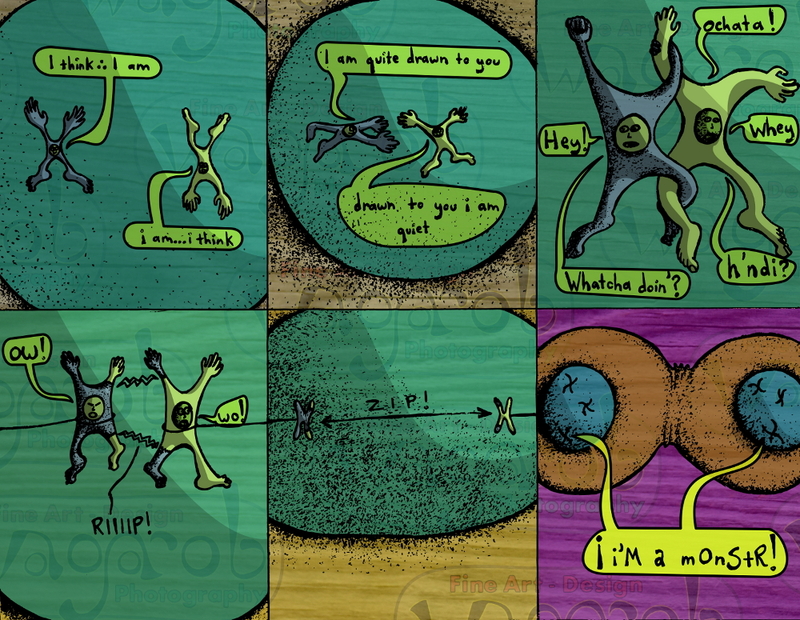 This entry was posted in Weekly Comics and tagged cell biology, cell division, chromosomes, cross over, descartes, opposites, spindle fibers. Bookmark the permalink.